Oh...meal planning in the summer is so hard. Some days its too hot to cook what you have planned and other days its to cold or raining too hard to have the outside meals that have been planned. Even after looking at the weather we just never know here in the Maritimes what it will be like from one minute to the next. It will be my first time making Pineapple chicken balls. I have wanted to try the recipe for a long time but its so expensive for ground chicken. However I scored a big deal the other morning at the grocery store and got a couple of packages for cheap! I will blog about the results of Mondays meal later this week. 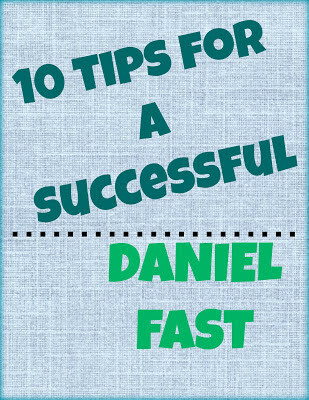 For more great meal ideas visit this blog and if you didn't have a chance to view my meal planning tips check them out. Dessert doesn't have to be loaded with calories and fat in order to be delicious. This is a simple way to make a nutritious dessert that will satisfy your after supper craving. 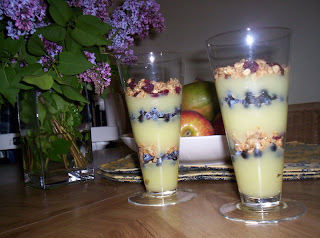 In a nice fancy glass I layer pudding, fruit, granola, pudding, fruit and top with granola. Having desserts that are made with milk (such as pudding or yogurt) is a great way to end any meal. Milk is an important part of our diet as it contains many vitamins and nutrients that our body benefit from. If you have a hard time sitting down and enjoying a glass of milk this is delicious way to get it! Last summer was the first time that I started making my own iced tea. I got the recipe from one of my favorite sites Hilbilly house wife. It was so delicious just as it is but of course I am always experimenting so I have added lots of different things to this basic recipe. Add fresh or dried mint leaves. Using mint green tea bags. After having a baby a wonderful friend gave me lots of tea (figuring I would need to stay awake for those late night feedings) that I have been experimenting with for the few hot days we have had. The latest is lemon mango; which is delicious. 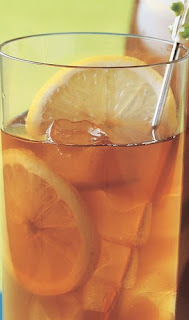 The basic Iced tea recipe is to boil 4 cups of water. Add any kind of tea and let steep 5-7 minutes (depending on how strong you like it). Then add the hot tea to a pitcher that already has 4 cups of cold water. Sweeten to taste and chill until served. This summer I am going to try to prepare iced coffee. I have been looking up many recipes on line and just happened to find a great friend of mine did post on iced coffee so here is the link. Hope you enjoy!! So for Tuesday night I had planned to have nachos because we needed something fast to eat so we could make a meeting that evening. But instead of piling up our nacho chips I decided to be a little creative. So this is a new favorite meal in our house. In my trusty cast iron pan I fried hamburger, onions, and garlic together. After draining the grease I put in some black beans, corn and a little bit of water. I covered and cooked on low for about 5 minutes to cook the beans and corn. 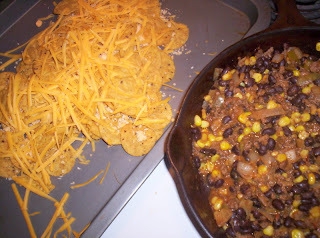 Then I added some salsa and Tex-Mex cheese whiz and let it simmer until it got thick. *Spices I added where cumin, curry, chili powder and red chili flakes. I placed this yummy mash in the center of our plate (topped with fresh tomatoes and green peppers) and place nachos around it to be used as utensils. Last year as part of an assignment I wrote an article (featured below) all about the use of herbs. I am always experimenting with the different flavors that they give to different foods. I never got the chance to grow my own garden because we lived in a basement apartment that never saw much sun light. Now that we have our own house that was my first summer project. My wonderful husband helped me find the location (just under our living room window on the front lawn), he watched me dig up the ground and then he placed these stick around it to give it a designer look. The following day a dear friend brought me some sheep manure and we started plating! I have been enjoying creating many dishes with these little guys. 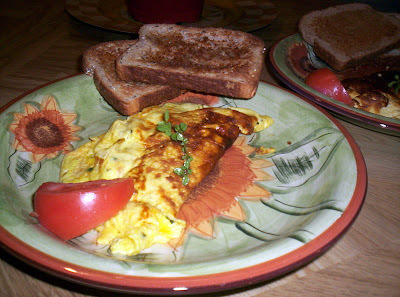 The fresh thyme is wonderful in my husbands omelets he mastered. The Tarragon is absolutely fantastic in seafood chowder and basic white sauce and nothing beats a pork roast thats been rubbed and stuff with fresh Rosemary. 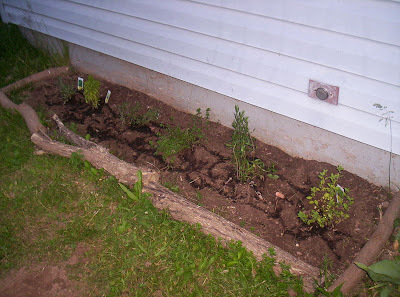 For this year I have planted 6 herbs Rosemary, Basil, 2 types of Thyme, Tarragon and Marjoram. Culinary herbs are different kinds of plants whose fresh or dried parts are used to season foods while cooking. Some of the most common culinary herbs used include basil, chives, marjoram, oregano, summer savory, rosemary, tarragon and thyme. Many of our favorite dishes have these herbs hidden in them, giving them their unique flavor. What would dressing be without summer savory or spaghetti sauce without oregano? Herbs transform meals by enhancing their smell, taste and color. They can be used lightly to give subtle flavor to dishes or they can become the star of the dish. Being adventurous and experimenting with different herbs is a great way to flavour food without added extra salt and fat. Listed below is some advice on which herbs to use with which foods and how to get the MOST flavor out of these herbs. Basil is key in tomato sauces and excellent with poultry, breads and salads. Preparation: Basil is a delicate herb that loses its sharp flavor if cooked for too long. Chives complement eggs, potatoes and cheese sauces. Preparation: Chop chives fine to allow more flavour to be released and add towards the end of the cooking process. Oregano is great in tomato sauces and as a pizza topping. Preparation: Oregano is a heartier herb that can be added earlier in the cooking process to allow its flavour to completely infuse your dish. Sage adds a lovely flavour to turkey, stuffing, pork, cheese and soups. Preparation: Sage is best used fresh and can be added during any time in the cooking process. Tarragon: Add a wonderful flavor to any tomato, egg or cheese dish. It’s also marvelous in cream based soups and sauces. Preparation: To maximize the flavor of thyme add early in the cooking process. Let me know if you have any tips on how to keep these guys growing, storing them when it comes time and of course cooking with them. Meal planning is getting a little bit difficult with me as I love to BBQ when its hot outside to keep the house cooler. However living in NB doesn't always allow for great planning as one day its hot and the next week it isn't. So I just have on hand some quick BBQ recipes and ingredients in case the weather warms and I decide not to use the stove. When planning a menu its good to make sure your plate is balanced. That means enjoying foods from each of the four food groups. Being sure that your family is receiving foods from each of the food groups is important as our body's need different foods to function properly. 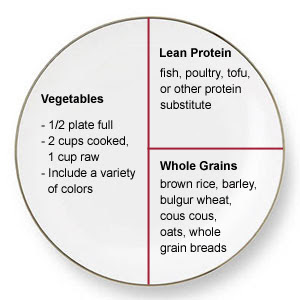 Following the plate guidelines may help you bring balance to your meals. The plate guidelines are as follows. Half of your plate should be filled with vegetables. All vegetables are good but Canada's Food Guide recommends selecting dark green and bringht orange vegetables more often. And lets not forget that potatoes are a vegetable and do go into this category. Then a quarter of your plate should be filled with a grain product and choosing whole grains more often is a better choice as these keep you fuller longer. The last quarter of your plate is reserved for your meat. Meat is not bad for us...its the amount we eat that is causing all the problems. You want your portion of meat to be about the size of your fist or the size of a deck of cards. You don't always have to have meat with your meals; even though my husband disagrees, it is good to have lentils and beans often. Also including fish into your weekly menu is a great idea as it contains lots of beneficial Omega 3 fatty acids that are great for your health and the healthy development of your children's brains. To ensure you are getting all the food groups enjoy a cold glass of milk with your meal and some fruit for dessert. Frozen fruit when its hot outside is a wonderful topper to any meal. With that said here is my menu. All meals are served with at least two kinds of vegetables. This time of year is great because salad ingredients are usually so cheap. We enjoy our vegetables either cooked or cut up raw. A couple of weeks ago my husband along with his siblings went fiddlehead picking. We love fiddleheads; so what a treat it is for us to have our freezer filled with them. Fiddleheads are a good source of vitamins A and C, niacin and riboflavin, and are nutritionally comparable to asparagus and other common green vegetables. Most cook books suggest that fiddleheads only be cooked until tender; however it is recommended that fresh fiddleheads be boiled for 15 minutes or steamed for 20 minutes before consumption. There is the basic way to eat fiddleheads which is boiled or steamed (15-20 minutes) and loaded with lots of butter and salt!! Since we have so many I wanted to find other ways to cook them; like in a creamy white sauce or in a lasagna. I was very disappointed that from searching google I didn't come across anything that was pleasing to my craving. So I had to do the inevitable...create my own invention. 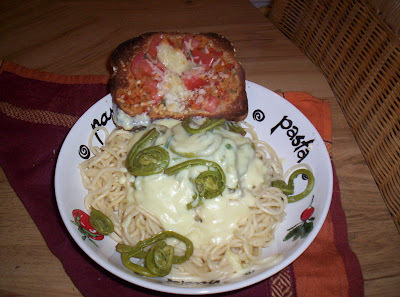 First I tried fiddlehead spaghetti...I know the name is so original! While the fiddleheads where boiling I made a basic white sauce; equal parts margarine and flour melted in sauce pan, then add milk until desired consistency. I did happen to have some soy milk in the fridge (only because I had a free coupon for it) so I used some of that which gave it a bit of a nutty taste. Once the sauce was thick I added some mozzarella cheese and for spices I added fresh thyme and tarragon. Served with a warm piece of homemade bruschetta this was delicious...but now what to do with the left overs. Well what do I usually do with my left over spaghetti? Make spaghetti pie of course, so that is what I tried with this stuff. 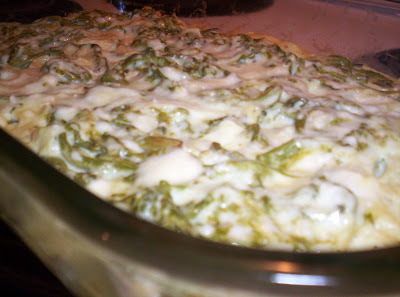 I followed my orginal recipe for the crust then I poured on the sauce, mozzarella cheese and fiddleheads. Its usually a childhood memory that gets my creativity working in the kitchen as I try to recall the ingredients, flavor and look of my favorite foods my mom use to make for me when I was little. 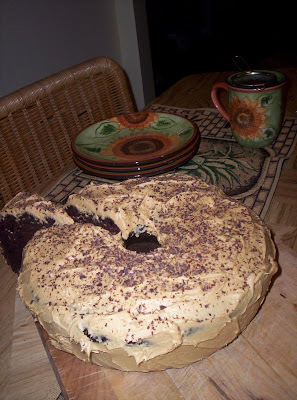 On special occasions or if my mom was craving it she would make a delicious chocolate cake and top it with peanut butter frosting. This was and still is one of my favorite treats. So I decided to make it recently when we had a visit from one of my very good friends. Its funny because we both have our nutrition degree and will both be Dietitians soon and yet I choose this cake to make for her during her time here. You see even us Dietitians practice moderation!! Step 1: Combine all dry ingredients together in large mixing bowl. Step 2: Combine all wet ingredients together in another bowl (Or I like to use my 4 cup measuring cup). Step 3: Pour wet ingredients over dry ingredients and mix well. Step 4: Pour cake batter into a cake pan. I have made this many different ways you can use a 9x13 pan, 2 round cake pans or a bunt pan. Step 5: Bake for ~ 20-30 minutes; depending on what type of pan you use. Now for the icing...this is my moms secret recipe! hehehe Ok, ok so basically its just peanut butter with icing sugar and a bit of milk to make it creamy!! Once the cake was frosted I grated some frozen dark chocolate on it for a nice Dietitian presentation! The cake was spongy and the icing was creamy, it went great with a hot cup of tea and a little bit of ice cream. My wonderful husband has come out of his cooking shell and has created a masterpiece!! This past Sunday morning (which was my birthday) I awoke to the sound to sizzling eggs and the wonderful aroma of coffee. I entered the kitchen and found Micah hard at work on this new creation, an omelet made with fresh thyme (from my new herb garden), cheddar cheese and tomatoes. In order to appreciate this you must know that Micah first is only learning to enjoy eggs and second he doesn't usually step outside of a recipe. He did use a recipe for the omelet but then decided before he folded the eggs over that he would place in a few freshly diced tomatoes. To make it a balanced breakfast he garnished the egg with a slice to tomato , a string of thyme and two buttery pieces of multi- grain toast. Honestly I must say that this was one of the best omelet I have ever eaten (NO ketchup required). The fresh thyme in it was superb!! Micah has definitely earned the COOK OF THE MONTH AWARD!!!! 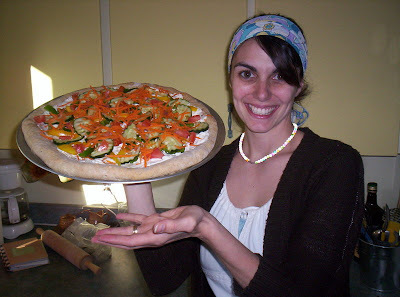 Here is a new twist for pizza that was a hit at a recent get together. The base is made from my favorite pizza crust recipe. I then bake the pizza crust for approximately 20 minutes to make sure its good and crisp because it doesn't bake once the ingredients are on it. Then for the "sauce" I mixed cream cheese with fresh dill and spread it all over the cooled crust. The toppings were made from sliced cucumbers, green peppers, yellow peppers, sliced tomatoes and grated carrots. The grated carrot adds the finishing touches as it looks like the cheese on pizza. This recipe is simple and makes for a light and yummy appetizer that can be taken to any get together. Just like when making pizza let your creativity shine and experiment with different vegetables. I know my mom puts broccoli on her pizza and uses broken cauliflower pieces as the topping to look like mozzarella cheese.